There were 712 press releases posted in the last 24 hours and 153,534 in the last 365 days. ROTTERDAM, SOUTH HOLLAND, NETHERLANDS, April 8, 2019 /EINPresswire.com/ -- Leapest, an EdCast company, continues to expand its catalog, with its customers now gaining access to the Web Age Solutions instructor-led technology training content covering key technology training topics in Big Data, Data Science and Machine Learning. Web Age Solutions has been authoring courseware since 1999. It has developed more than 450 technology courses on various vendor platforms, numerous development environments and industry recognized methodologies. An in-house team of experts focuses on content development and maintenance to ensure high-quality materials are offered to instructors and learners. The training labs come with extensive setup guides, remote technical support and solution files for instructors. Furthermore, the cloud-based lab setups eliminate the need for learners to do their own installation or to have an advanced computer on their end. Agile – addresses the skills required by various roles in the Agile program. DevOps – covers all roles, process and the tools aspect of DevOps. Architecture – featuring the largest collection of architecture courses in the industry. These courses cover various aspects of Enterprise Architecture, Solution Architecture, and Business Architecture. Big Data – Hadoop Programming and administration in both Cloudera and HortonWorks are covered. Spark, Machine Learning and Data Science courses complete the coverage. Cloud– OpenStack, Azure, and AWS are covered. Learning paths address all roles in the organization. Microservices (as well as SOA) – Technical introduction to Microservices is the flagship course in this area. The SOA curriculum is one of the broadest in the industry. Java, JEE and Spring – features Java 8, Spring, Spring Boot, and Spring Cloud courses. Mobile– Android, iPhone and Cordova courses are available. “ We earned our “Preferred Vendor” status with the Fortune 100 global leaders as a result of our highly progressive approach to education and project-based mentoring. Two-thirds of Fortune 100’s have chosen Web Age as a trusted partner. We are delighted to join forces with Leapest and EdCast to support upskilling initiatives globally,” says Greg Wagner, Vice President, Web Age Solutions. 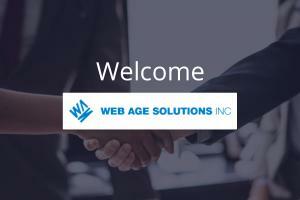 “We are really excited to partner with Web Age Solutions. With the increasing pace of technology changes, there is an acute shortage of professionals with the skills that are needed to support digital transformation initiatives. Leapest Marketplace is designed to reduce the distance between content creation and consumption. We believe that by creating this efficiency, we enable training managers and training providers to prepare a future-ready workforce at scale,” says Sukhbir Jasuja, CEO Leapest by EdCast. Leapest offers a Corporate Learning Marketplace for training resources including courseware, eLearning, business simulations, certifications and instructor service. Our current catalog features key topics in IT training. Leapest provides the ease to a comprehensive portfolio of in-demand training topics. Architected for agility, scalability, and reliability, we focus on building and enriching an ecosystem in corporate training. Visit us at https://www.leapest.com. Web Age Solutions has been providing Instructor Led Training, Mentoring and Coaching to mostly a Fortune 100/500 client base since 1999. We provide support for vendor and platform neutral technologies combined with deep expertise in multiple technology platforms, including IBM, Oracle, Microsoft, AWS, Red Hat and several Open Source solution stacks with experience in delivering strategic transformational projects. We bring our cutting edge research, in house developed courseware and delivery in the DevOps, Cloud, Agile, Architecture, Microservices, Java EE, Mobile, Big Data and digital transformation space. We pride ourselves on our outstanding service flexibility and extreme responsiveness.